Katherine Reutter is ranked #1 as she goes into the World Championships this weekend. We’re extremely proud to sponsor her and therefore want to acknowledge this wonderful accomplishment. We are therefore holding a “Countdown to Worlds” contest throughout this week to celebrate Katherine and show her how much support she has as she skates to take the top spots in her events. 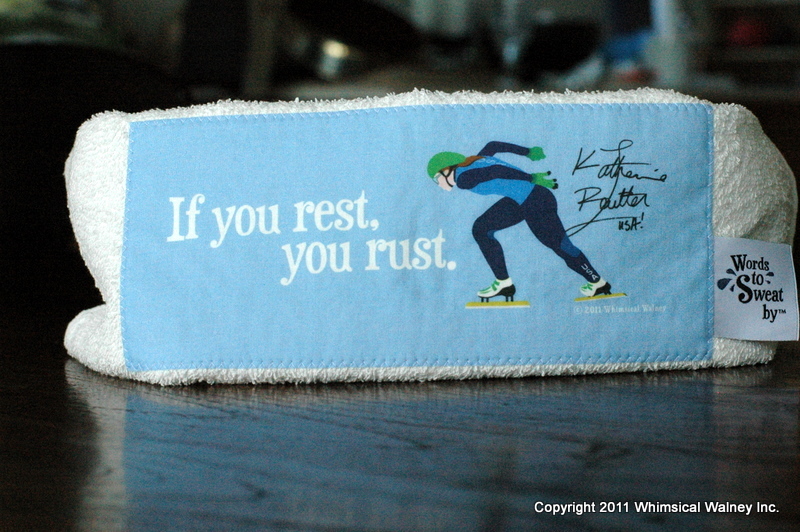 As always, we like to have fun here at Words to Sweat by, so we’re going to pose a question to you, her fans, about Katherine for an entry to win a World-Class Words towel with her mantra every day this week. But wait, there’s more! Katherine has an impressive 2800+ fans on Facebook and 2600+ followers on Twitter, so we know that not only will her fans come out to comment, but they’re be sure to tell their friends. For this reason, we also want to offer a grand prize based on how much noise we can make in support of Katherine by spreading the word online. 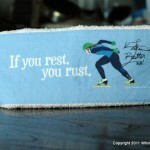 If we reach a total of 300 comments throughout the course of the countdown, the grand prize will be an, “If you rest, you rust” towel with not only Katherine’s signature, but also as many World Championship speed skating signatures as Katherine can get before the season ends. Since a good warm-up is always necessary before a race, we’re going to start with an easy question and they’ll get more difficult the closer we get to the competition. Question of the Day: What is Katherine’s favorite food? The grand prize winner will be selected from the total number of entries throughout the countdown using a random number generator. If you have entered a valid answer each day of the countdown, you will have five (5) entries in the grand prize drawing. Mac n’ cheese is her favorite food. It HAS to be Wheaties…she sure skates like that’s all she eats! chocolate is Katherine’s favorite food. Wow! such energy requires lots of carbs. Katherine likes that good old staple of struggling athletes, cheese and macaroni. Hope it’s her favorite! Pasta with cheese and meatballs! Deep Fried Snickers and oreos! As much as I would love to say ice cream, it is mac and cheese. Look’s like Mac ‘N Cheese is the way to guess..
Well, if its sweets, then it is chocolate. But if it is food then Mac and Cheese. So I go with Mac and Cheese because that is more a food and chocolate is a sweet or desert! I’m going out on a limb with sushi, but I know a Red Robin cheeseburger is a secret fav too! Peanut butter, banana, and honey on bread.